If your purchased game has a DRM (Digital Rights Management) protection, you can find the required activation key or the serial number in your account under "My Games" when you click on the corresponding game. In general the game asks for the activation key during the installation. 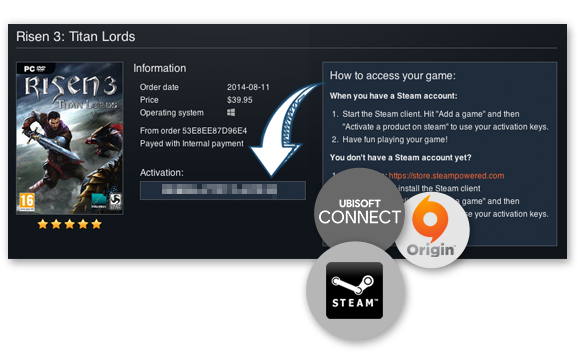 If any special steps are needed to activate the game, such as the creation of an account with a particular game's publisher; you will find the corresponding information in your account. Can I use Steam/Origin/Uplay Keys from the German store if I'm not living in Germany? Yep! all of our keys are official World wide keys with no restrictions, with just a few rare exceptions. On these occations you will find a clarly visable notice about it near the top of the games page. 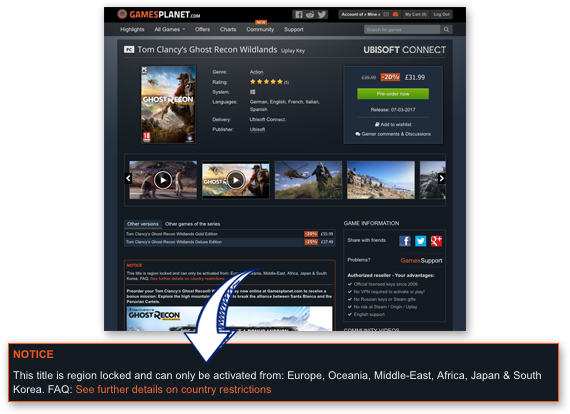 How can I know if my game can be activated in my country? The majority of our keys will work everywhere with no restrictions. In some rare cases the game will not be available for certain countries. In those cases this will be clearly labled in a notice box near the top of the page. (See the above picture). Can I play/activate without VPN? Absolutely! We only sell official keys directly from the publisher. What you see is what you get with Gamesplanet.